Let me show you all the options I currently offer. You can pick the shapes, sizes, colours and even the message to appear on your items. Take your time, look at all options, then scroll to the bottom of the page and send me an order form. 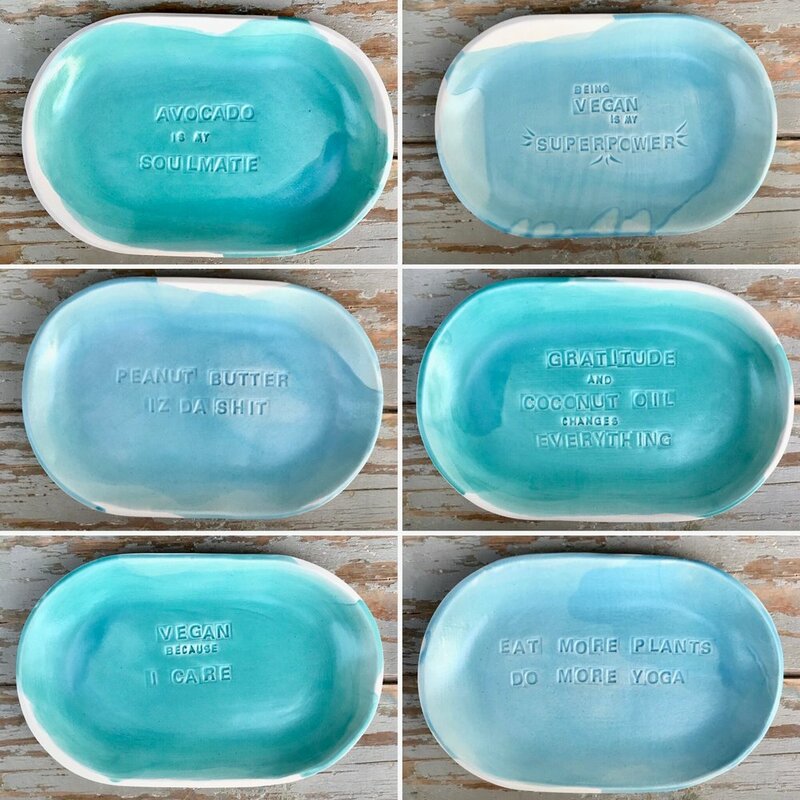 I highly suggest you do this on a laptop or desktop as the image captions do not appear on mobile, so you will miss important informations, for example the name of each glaze shown on the picture. Check out all options within each category! Round plates come in 3 different sizes: S, M and L. You can also pick from 2 rim styles: SLIM or DECO. SLIM rims are the most classic versions. Can not go wrong with that choice. However sometimes I like to give my plates something extra. For DECO(rated) RIM I leave a wider rim around the plate and I decorate it by hand using different tools. Please allow me my creative freedom when ordering a plate with DECO RIM. Probably the cooles thing is that you can pick any of my 13 designs. Click to enlarge! These designs are protected by copyright, please do not share, reproduce, copy or use as your own. 7, 8, 10, 11, 13 are NOT available in size M and L.
Do not forget to pick your fave colour. These are matching colours, so do not be afraid to combine them. AQUA, APPLE, AVOCADO, PLUM and FIG are currently on offer. 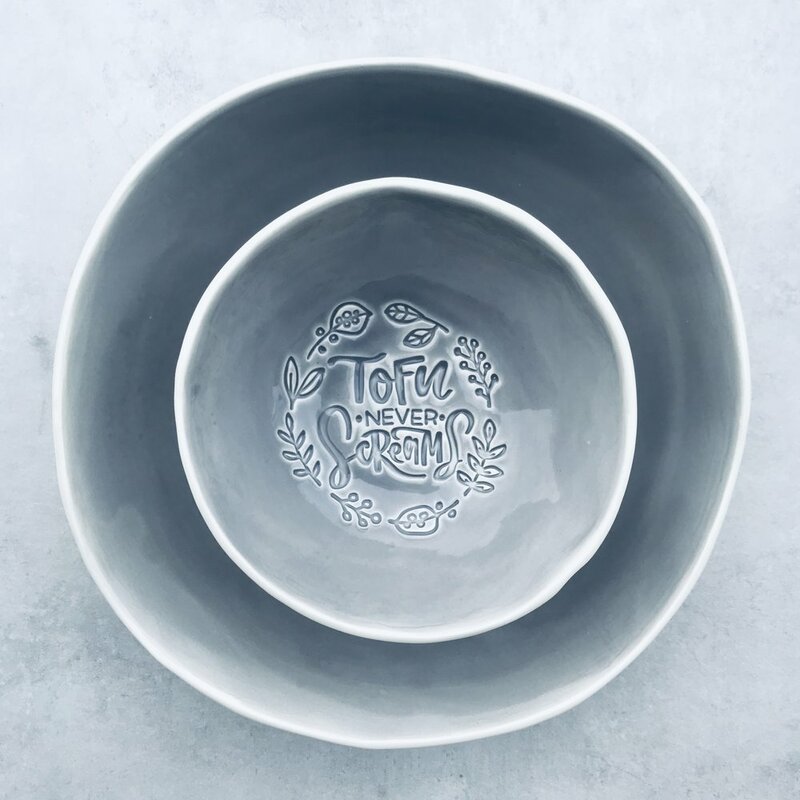 Please note that the top of the SLIM rim and the bottom of the plates are left unglazed to reveal the beautiful white stoneware clay. It is matt in texture but polished so it feels nice to the touch yet it creates a lovely contrast with the shiny colour on the inside. 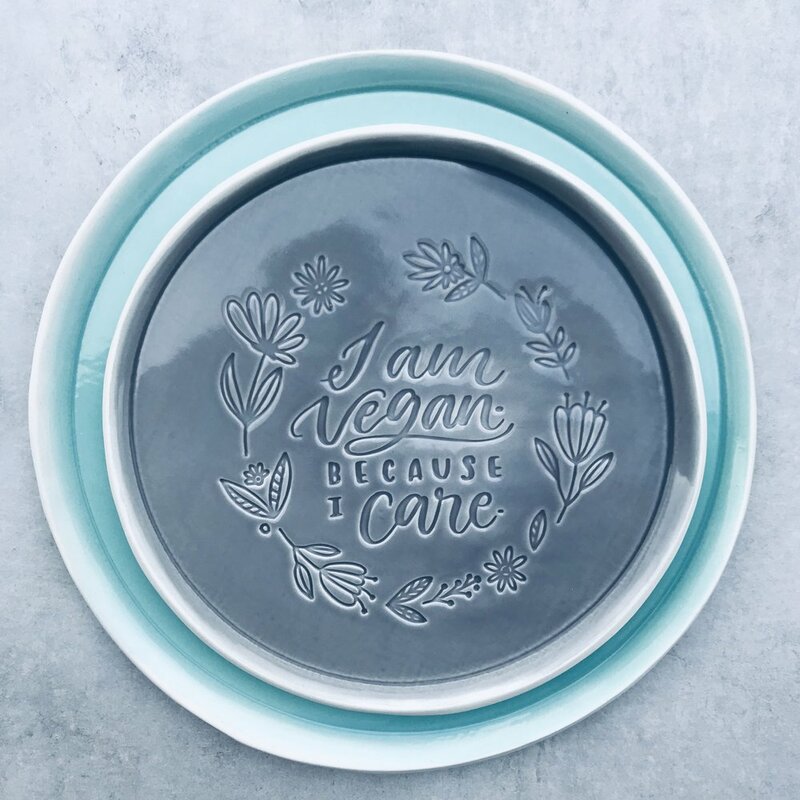 If the white clay gets slightly discoloured or scratched from getting in contact with other surfaces (for example metal), you can simply wash it off with water. These discolourations are normal and only temporary. 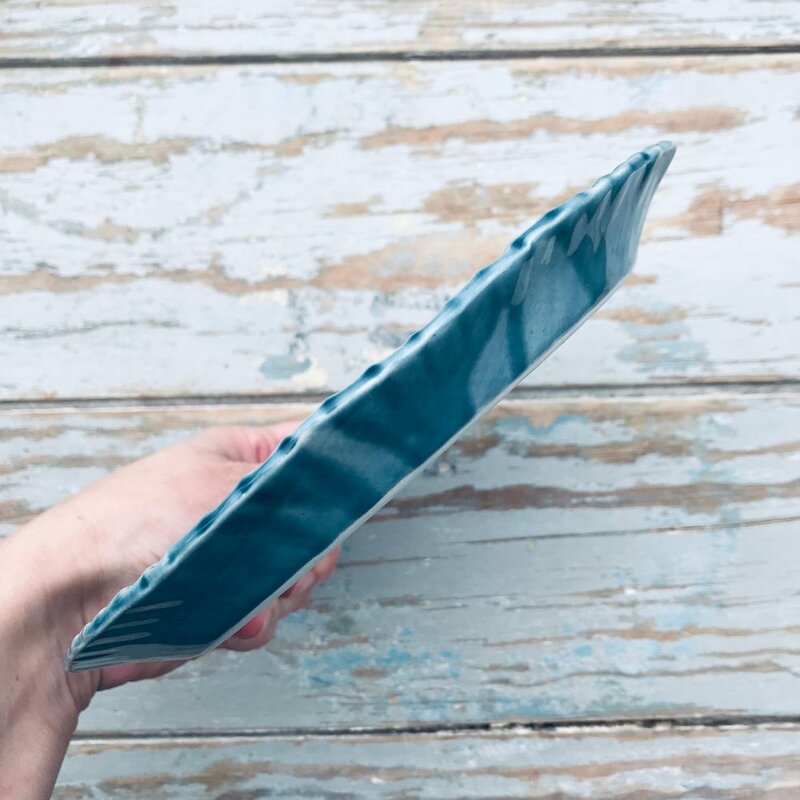 You can order bowls in 3 sizes: S, M, L.
7, 8, 10, 11, 13 are NOT available in size L.
I am offering 5 options for the glaze on the INSIDE, just like with the plates: AQUA, APPLE, AVOCADO, PLUM and FIG. Oval plates are my classic, best-sellers. They are 25 x 16 x2,5 cm. Size can differ slightly as all items are unique, handmade pieces. They look best with sandwiches, wraps, salads, pasta or even a small bowl of soup on one side of the plate and a small baguette on the other. I stamp the letters one by one meaning it is more work for me, but endless customising possibilities for you. You get to choose ANY TEXT. ANYTHING! You can skip the text and ask for a LEAVES or LOTUS pattern instead. This glaze is not available, only the pattern! Do not forget to pick your colour! Oval plates come with a special, silk matt glaze. You can choose between TURQUOISE and LIGHTBLUE options. It can be hard to tell the difference sometimes on photo or real life. Turquoise can look blue, blue can look turquoise depending on lights. All prices are shown per piece, in SEK (Swedish Krona) and including VAT. To get an estimate calculation in any other currency, visit xe.com.